Really, an announcement like this is pretty unprecedented. But if anyone can pull it off, its the champions of PC gaming, Valve Software. Today they have announced that the PlayStation 3 version of Portal 2 will not only be playable cross platform with PC gamers in 2 player co-op, it'll also include free access to the Steam version of the game on the PC or Mac. Along with the cross platform play comes cross platform chat, so PS3 gamers can use voice chat to talk to PC gamers during their multiplayer sessions. The game also supports cloud storage for saved games on the console, meaning you can save the game at your house, bring it to a friend's house, log into your account and load your saved game - no memory card required. Sadly the ability to resume on a different platform didn't make the cut, though, Valve had originally planned for it. Portal 2 is also planned for the Xbox 360, but because of the closed nature of Xbox Live, none of these features are possible. This is the first time Valve is bringing their Steam platform outside of computers. Last year Valve brought Steam to Apple's OSX operating system and with it launched their SteamPlay platform - games that you bought once and could play on any version of Steam you have. 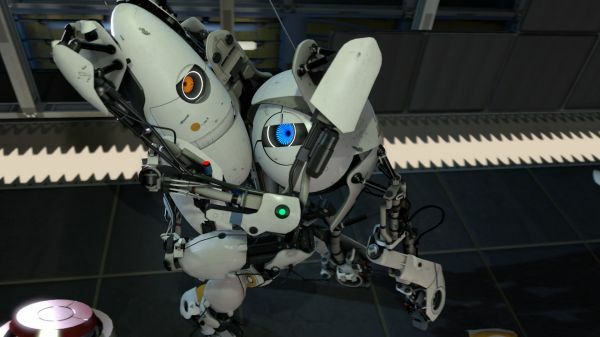 Portal 2 is extending this feature to the PlayStation 3 as well. “The customer doesn’t think exclusively about where they’re playing their games or how they’re playing them, most customers have multiple devices. They don’t want to have to buy this version and buy that version, and not be able to play something because they have that version – they just want to pay their money, get a good entertainment experience and they want it to work. I said that this was unprecedented - Sony and Valve have a long history of grievances, nobody expected this kind of support when the game was announced for the PS3 back in June 2010 at E3. Valve's Gabe Newell has stated many times over that the PS3 was difficult to develop for and they were unhappy with trying to bring other Source titles to the platform, notably, Left 4 Dead. Think about it - you can pick up a PlayStation 3 copy of Portal 2 for $60 (or less) and basically get the PC version for free. This was a triumph for Sony, Valve and gamers.